One of the hardest sales to resist, aside from nail polish, is clearance holiday candy! Who doesn’t love festive candy? I mean there are some crazies out there who don’t I guess, but most people do! Even some of the healthiest people I know can’t resist candy once in a while. 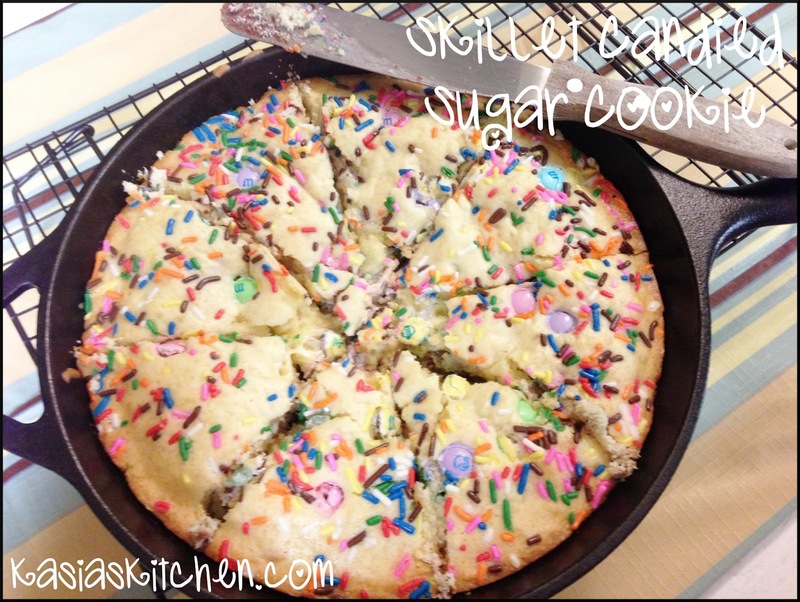 I made this skillet sugar cookie back when I happened upon an after Easter candy sale. Guess what today is? (Happy 4th by the way!) Guess what’s on sale?! Patriotic candy! After you recover from your holiday celebration, go get some clearance candy and make this! Regular candy can be used too of course, but festive is just more fun. Preheat oven to 350. Mix sugar cookie dough per package directions. Add M&Ms to the dough, saving out a few. Grease your cast iron skillet with coconut oil and a paper towel. Press cookie dough into skillet. Pour the sprinkles over the dough. Press in a the reserved M&Ms on the top of the dough. Bake for 12-18 minutes or until edges brown and center is golden. Cut into slices and enjoy!